Letter from [John Muir] to Helen [Muir], 1909 May 2. 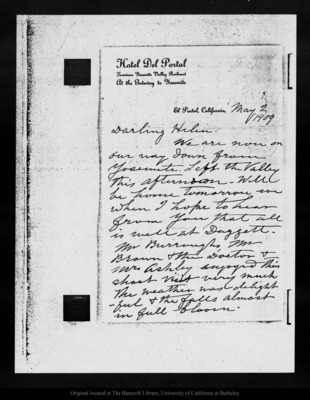 [letterhead]El Portal, California May 21909Darling Helen.We are now on our way down from Yosemite. Left the Valley this afternoon. Will be home tomorrow eve when I hope to hear from you that all is well at Daggett. Mr Burroughs, Mr Brown & the Doctor & Mr. Ashley enjoyed their short visit very much The weather was delightful & the falls almost in full bloom.